Charles Clement Lucas was the son of an eminent London surgeon and also a member of the distinguished Pelly family. Although he probably spent little time in West Lavington, his family had a house in the village and were strong supporters of the village school and church. 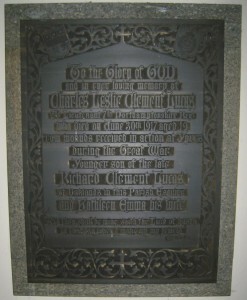 As well as the war memorial, he is commemorated by a plaque in St. Mary of Magdalene Church in West Lavington. 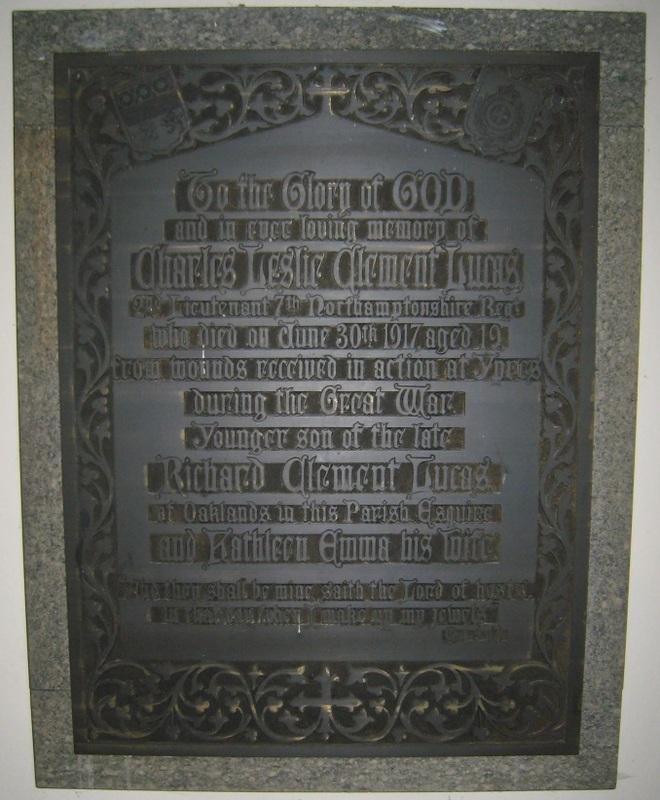 Charles Leslie Clement Lucas was born at 50 Wimpole Street, London on 23 December 1897, the second son of Richard Clement Lucas FRCS (1846–1915) and Kathleen Emma Pelly (1856–1912). His father was an eminent surgeon at Guy’s Hospital in London, where he was a consultant surgeon, specialising in renal (kidney) surgery. He was also a lecturer on surgery at the hospital until his retirement in 1906. The family home at Oaklands, West Lavington had been acquired by Richard’s father, William, in the 1870s. The house at 50 Wimpole Street had been the home of the poet Elizabeth Barrett Browning between 1838 and 1846. Charles’s mother, Kathleen, was a member of the distinguished Pelly family. Her father, Saville Marriott Pelly CB, FRCS (1818–1895) was also a surgeon, serving with the army in India where he became Surgeon-General. His brother, Sir Lewis Pelly (1825–1892) was a Conservative Member of Parliament and an officer of the East India Company. Kathleen’s family included the Pelly Baronets, all being descendants of John Pelly (1711–1762). Admiral Sir Henry Bertram Pelly (1867–1942), Rear-Admiral Peter Douglas Pelly (1904–1980) and Air Chief Marshal Sir Claude Pelly (1902–1972) were all distant cousins. Charles was educated at Epsom College and then King’s School, Rochester from 1913 to 1915. The school magazine, The Roffensian, reported that he had obtained a Lower Certificate from the Oxford and Cambridge Examination Board and that he had gained admission to Sandhurst on the Headmaster’s nomination. At King’s School, he was a keen footballer and was a member of the school’s first XI. He had originally planned to go up to Oxford University and later take holy orders. The obituary in the school magazine said: He will always be remembered for his cheery, good-tempered disposition, which made him very popular with his schoolfellows. In 1915, he joined the Royal Military Academy, Sandhurst as an officer cadet. On 6 April 1916, he graduated from the academy with the rank of Second Lieutenant, joining the Northamptonshire Regiment. In mid-June 1917, the 7th Battalion, Northamptonshire Regiment was in the Messines area, south of Ieper (Ypres), just after the Battle of Messines Ridge where the British Army had scored a momentous victory on 7 June. Nineteen huge mines had been exploded under the German positions along the Ridge (the reverberations were felt in Southern England). The surviving Germans were so shocked and devastated that many of them surrendered. All objectives had been taken within a few hours. The Germans soon recovered and began shelling and counter-attacking the captured positions. During the period 15 to 23 June 1917, the Battalion was situated in front of the notorious Hill 60 at Klein Zillebeke. There was constant shelling throughout this period and casualties were high. The 7th Battalion lost 7 officers and 115 other ranks killed or wounded. 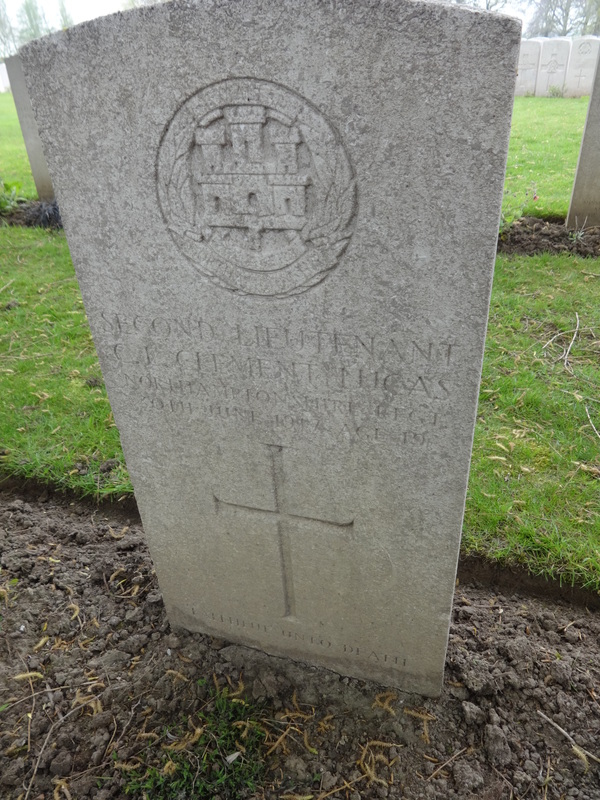 Charles Lucas died at the dressing station at Lijssenthoek on 30 June 1917 of wounds inflicted by a shell. 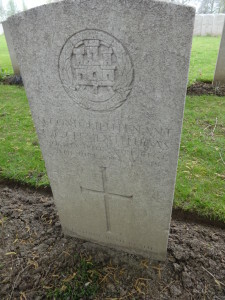 He was buried at Lijssenthoek Military Cemetery, south west of Ypres, Belgium. In 1920, his family installed a memorial plaque inside the Church of St Mary Magdalene at West Lavington, a few hundred yards from the family home. The memorial includes a verse from Malachi 3:17: “And they shall be mine, saith the Lord of hosts, in that day when I make up my jewels“. The family also contributed generously to the cost of the memorial to all the men from the parish who had been killed during the war, with his brother, Richard, donating £15 of the £100 cost of casting, and his aunts, Catherine and Mary, £8. Charles is also commemorated on the King’s School War Memorial in the Lady Chapel of Rochester Cathedral and on the School’s Memorial Board. Both his parents had died before Charles joined the Northamptonshire Regiment. His elder brother, Richard Saville Clement Lucas (1896–1968) also served in the war, with the Royal Artillery. After the war he went to Oxford University and was a proficient rower. He was a member of the Leander eight which won the silver medal for Great Britain at the 1920 Summer Olympics held in Antwerp, coming within half a length of winning. In 1921, he was a member of the (losing) Oxford crew in the Boat Race. Richard married Rene Wood in 1948 and died in 1968 of a heart attack while sailing his dinghy. Charles’s aunts, Catherine and Mary Lucas, both continued to live at the family home at Oaklands until their deaths in 1935 and 1927, aged 92 and 84 respectively. The “Misses Lucas” had played an active part in the life of the parish and the village school, with Catherine being the church organist for many years, and Mary running the church Sunday School. Along with her brother Richard, Catherine was a manager at West Lavington School and both sisters were frequent visitors to the school. On Empire Day, the schoolchildren would be invited to Oaklands, where the sisters would scatter sweets on the floor for the children to scramble for. Catherine and Richard were both members of the Parochial Church Council in the 1920s.